Join this windsurf camp for the best way to improve and progress your skills! The training, in and out of the water, is closely guided by the professional instruction, Alon Kaplan. The instructions will be in English and this windsurf camp is focused on improving your technique. However, you will still have fun while doing it. The location is a charming and relaxing beach that allows for an excellent combination of vacation with study and improvement in windsurfing. Hotel Athinoula is a family hotel which is simple and comfortable, a few minutes' walk from the surfing club (not located on the coastline). There is a pool at the hotel and this hotel includes breakfast. 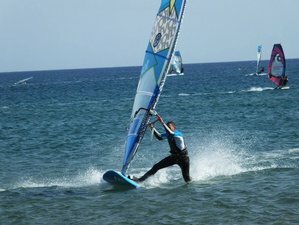 This windsurf camp focuses on all the basic techniques of surfing and therefore is especially suitable for beginners and advanced skiers, as well as surfers who want to enjoy open spaces, good wind, and flat water. You will find smooth water and good wind (weak in the morning, strong in the afternoon) suitable for beginners and experienced skiers who want to progress and enjoy these comfortable conditions. The training combines group study, personal guidance, time of practice, and time for free surfing. The exercises are adapted to the surfing conditions and the level of the participants. The new equipment is mostly replaced every season or two. This is a great opportunity to try out a variety of high-level surfboards and interpreters that help make surfing an easy, enjoyable experience, and help you decide to buy suitable equipment for anyone who is planning to do so. Capalus likes to surf fast. The surfing conditions allow speed enthusiasts to enjoy, improve, and even measure the speed of the end. You can experience professional slalom equipment (at an additional cost) and you can also organize speed racing among surfers, including the floating of the boat and accompany the motorboat. Alon Kaplan was born in 1969 in Kibbutz Ginosar by Lake Kinneret (Sea Of Galilee). He has been an active participant in water sports since childhood and has been teaching windsurfing for all levels and he loves it! His ongoing love for water sports began when he was a child in the early 1980's. He has enjoyed passing it on to others since then. His instruction is based on precise and flowing moves that will make your surfing easy and fun, right from the first steps. This windsurfing camp will be located in Kefalos beach, Greece. Please book your flight to arrive at Kos Island International Airport (KGS). Transfer from and to this airport is available upon request. It is about 30 EUR per person depending on the number of passengers. The flight is a direct charter flight to Kos. Flight times and price can change without notice. Flight prices can be obtained from websites and travel agencies. Airport: Kos Island International Airport Airport transfer available: Kos Island International Airport (US$34 per person) Additional charges may apply. You can request this in the next step. Alon Kaplan offers windsurfing lessons and clinics based in Israel, Greece, and other locations around the world.